These truffles are so easy, but taste like you spent all day making them! Crumble up the entire package of oreos. It would be easiest in a food processor, but I did it in a blender. You could also just smash them up with a rolling pin in a giant ziploc bag. Totally up to you. Mix in your cream cheese. You can do this in a bowl, or toss it into the food processor. In a separate bowl, melt 2 cups of chocolate chips in the microwave. (Put it on 50% power, and stir every 30 seconds, so they don’t burn!) Next, roll the oreo/cream cheese mixture into balls. Use a fork to dip them into the melted chocolate. Place them on wax paper, and sprinkle with optional toppings. I did some coconut, some plain. I also wanted to use crushed walnuts but I didn’t have any on hand. 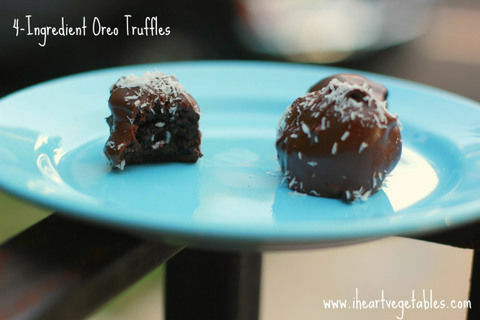 This works really well with Glutino Gluten Free Chocolate sandwich cookies also!!! YUMMY.. People should really try this recipe, these are AMAZING!